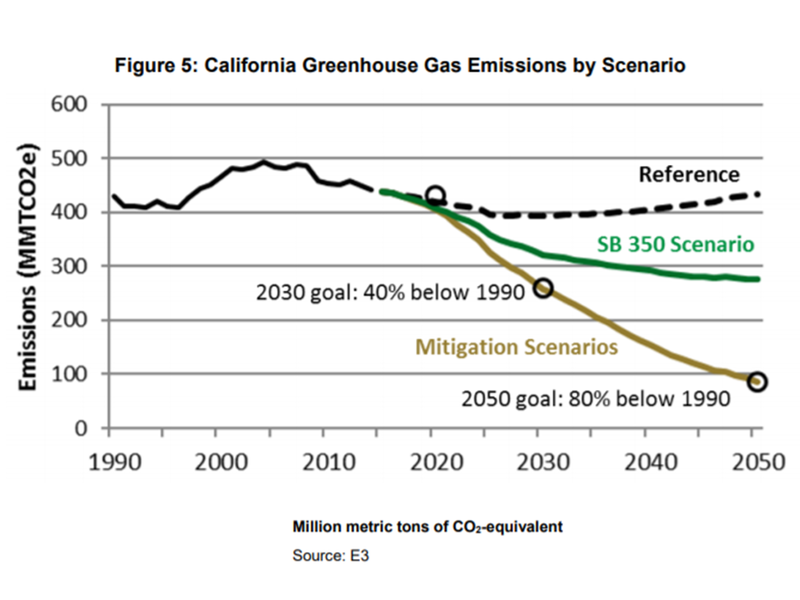 Ten mitigation scenarios are evaluated, each designed to achieve the state’s greenhouse gas reduction goals subject to a changing California climate. All mitigation scenarios are characterized by high levels of energy efficiency and conservation, renewable electricity generation, and transportation electrification. This project evaluates long-term energy scenarios through 2050 using a techno-economic model known as the California PATHWAYS model. 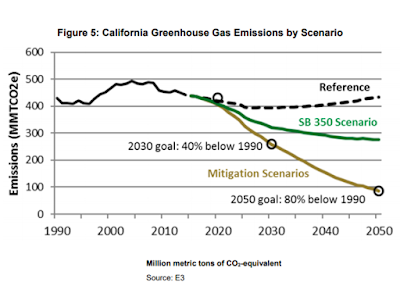 These scenarios investigate options and costs for California in a changing climate to achieve a mandated 40 percent reduction in greenhouse gas (GHGs) emissions by 2030, and an 80 percent reduction in GHGs by 2050, relative to 1990 levels. In 2017, California extended the state’s Cap-and-Trade Program through 2030 (Assembly Bill 398, Garcia. Chapter 135. Statutes of 2017). The carbon price resulting from the Cap-and-Trade Program will help improve the economics of low-carbon alternatives, yet it is not clear whether the carbon price on its own will be sufficient to close the gap between emissions reductions achieved through current policies and the 2030 GHG target. The scenarios investigated in this research suggest that additional upfront cost incentives or subsidies, technological breakthroughs, and business and policy innovations may be required. While this research does not specifically address the role of cap and trade in meeting the state’s climate goals, it highlights the physical transformations of the state’s energy economy that is necessary and the challenges in accomplishing that transformation for new equipment sales, megawatts of renewable energy procured, and the production of zero-carbon fuels. • What are the priority, near-term strategies in the areas of scaling-up deployment, market transformation and reach technologies needed to achieve California’s 2030 and 2050 GHG reduction goals? • What are the risks to, and potential cost implications of, meeting the state’s GHG goals if key mitigation strategies are not as successful as hoped? 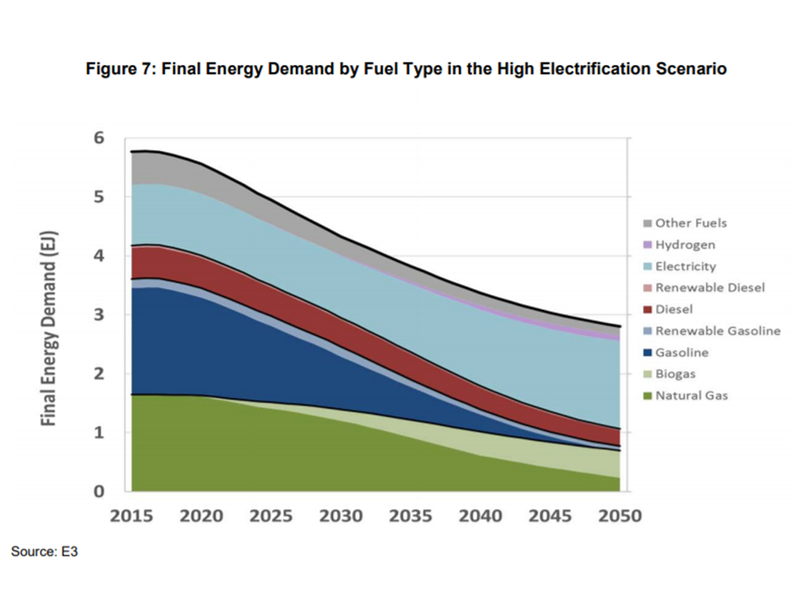 Long-term energy scenarios through 2050 are analyzed using the California PATHWAYS model, an economy wide, technology-specific scenario tool developed by Energy and Environmental Economics (E3) from 2009 through the present. 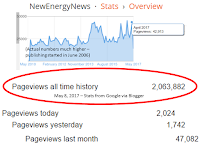 The PATHWAYS scenarios leverage prior research and analysis from other state energy agencies and from E3, building upon and expanding E3’s prior work. These scenarios use the latest research from the University of California Irvine (EPC-14-074) with results providing the expected impacts of climate change on the electricity sector through 2050. These results specifically show a lower average availability of hydroelectric generation available to California and higher average temperatures, which result in lower heating demands in buildings and higher air-conditioning demands. In addition, researchers use a least-cost capacity expansion dispatch model, E3’s Renewable Energy Solutions Model (RESOLVE), to test the impact of the PATHWAYS scenarios on the California electricity grid. The RESOLVE model evaluates least-cost capacity expansion options for the California electricity sector and generation dispatch solutions through 2050 using the PATHWAYS scenario results of an electricity sector greenhouse gas constraint and a set of electricity demands. The modeled geography represents the entire state (with simplified assumptions in the rest of the Western Interconnection) through 2050. Key changes to these scenarios, relative to E3’s prior work, include updated technology and fuel cost assumptions, with lower cost trajectories for renewable electricity, energy storage and electric vehicles, and updated cost assumptions for alternative fuel trucking technologies. The analysis also includes a lower base case assumption about the consumer cost of capital. In addition, most scenarios consider a biofuels-constrained future, whereby only biomass waste and residues are available to produce biofuels from within the United States. Purpose-grown crops are excluded from these scenarios because of the potential emissions from indirect landuse change. In these scenarios, biofuel production efficiencies and costs do not change over time, resulting in relatively limited and high-cost biofuels. 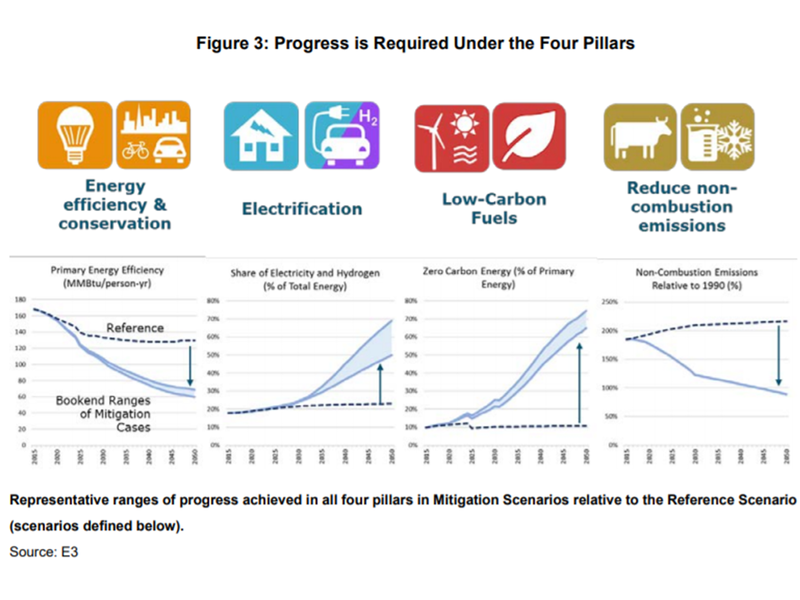 • “Mitigation” scenarios are evaluated which meet the state’s 2030 and 2050 GHG goals using different combinations of greenhouse gas reduction strategies. 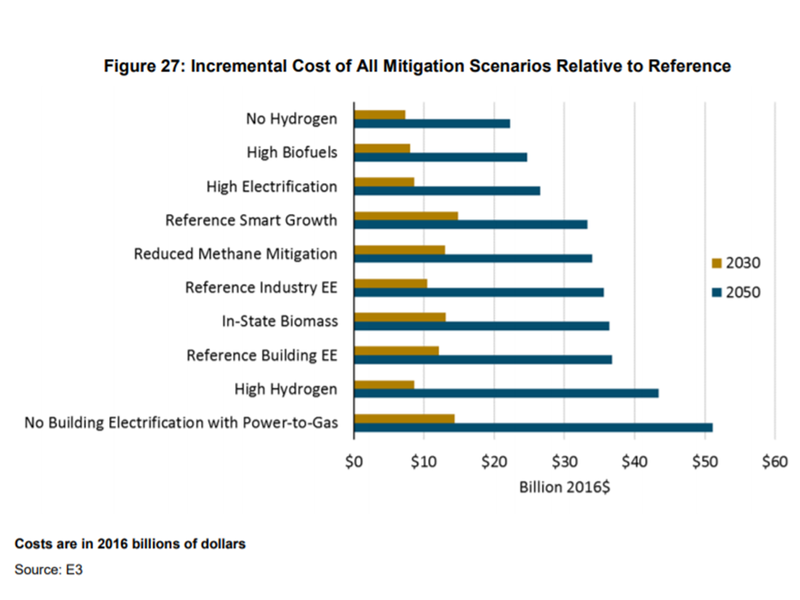 The “High Electrification” scenario is one of the ten mitigation scenarios evaluated, which meets the state’s climate goals using a plausible combination of greenhouse mitigation technologies. Scenarios test the impact of over- or underperformance on key technology deployment trajectories to assess potential cost risks, and to identify priority areas for near-term action for deployment, market transformation, and “reach” technologies that may be required to meet the 2050 greenhouse gas target. A reach technology is a technology not widely commercialized today but has been demonstrated outside of laboratory conditions and has the potential to mitigate emissions from sectors that are currently difficult to address. Ten mitigation scenarios are developed in total to help identify which strategies are most critical to meeting the state’s 2030 and 2050 greenhouse gas goals. These scenarios are used to identify key technology risks and to evaluate the robustness of the state’s climate mitigation strategies if one strategy does not deliver greenhouse gas reductions as expected. 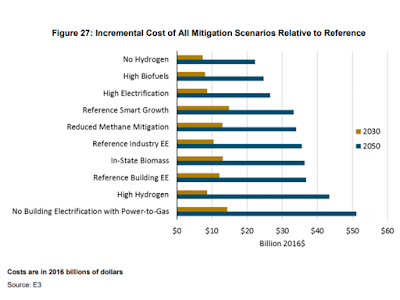 The report focuses on the High Electrification scenario, which is one of the lower-cost, lowerrisk mitigation scenarios. This scenario includes high levels of energy efficiency and conservation, renewable electricity, and electrification of buildings and transportation, with reliance on biomethane in the pipeline to serve mainly industrial end uses. The High Electrification scenario assumes a transition of the state’s buildings from using natural gas to low-carbon electricity for heating demands. This transition presents a suite of implementation challenges including uncertain feasibility and costs of retrofitting the state’s existing building stock, equity and distributional cost impacts, as well as consumer acceptance. Achieving California’s climate goals will fundamentally transform the state’s energy economy, requiring high levels of energy efficiency and conservation, electrification of vehicles, zerocarbon fuels and reductions in non-combustion greenhouse gases. 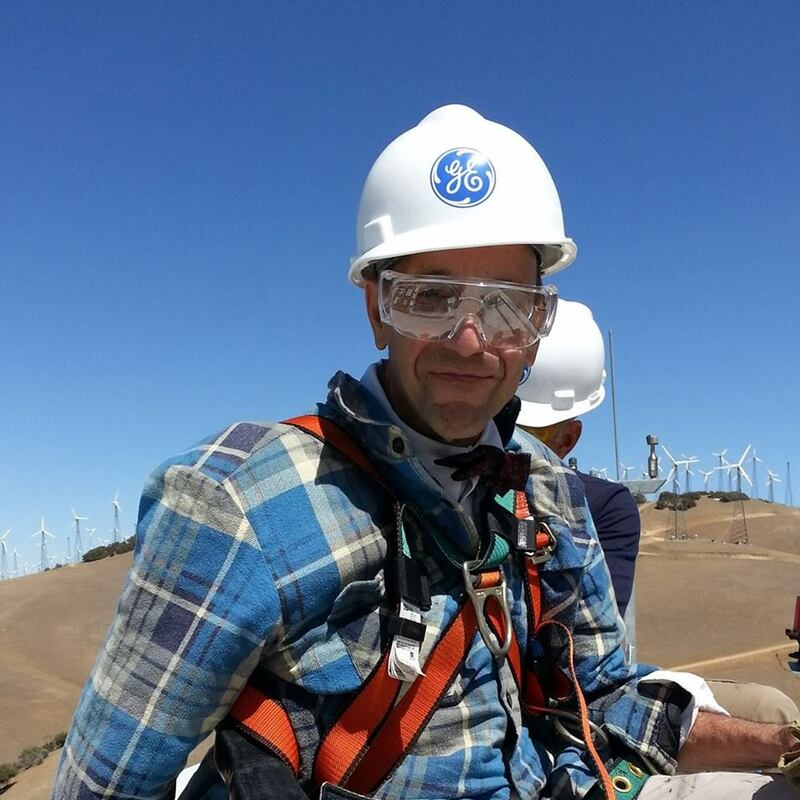 Meeting the state’s 2030 climate goals requires scaling up and using technologies already in the market such as energy efficiency and renewables, while pursing aggressive market transformation of new technologies that have not yet been utilized at scale in California (for example, zero-emission vehicles and electric heat pumps). 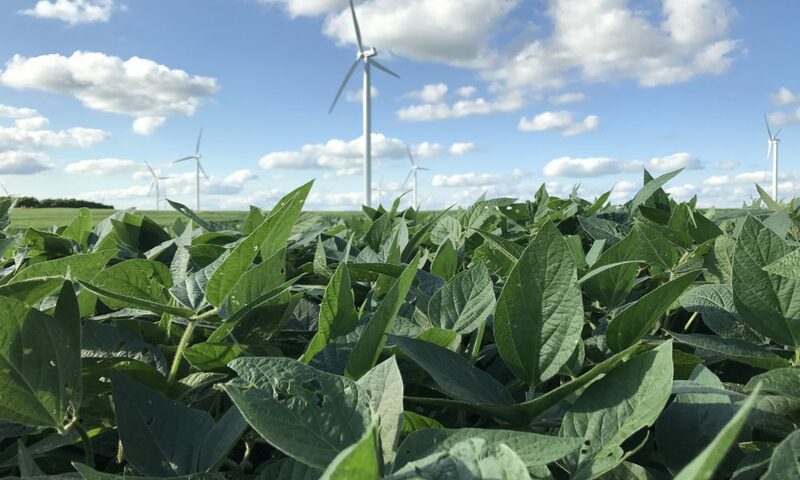 In addition, at least one “reach” technology that has not been commercially proven will likely be necessary to help meet the 2050 greenhouse gas goal, and to mitigate the risk of other greenhouse gas reduction solutions falling short. 1. Higher carbon prices, such as those created by the state’s cap and trade and low-carbon fuel standard programs, which reduce the cost differential between low-carbon fuels and fossil fuels. 2. Codes and standards, regulations and direct incentives, to reduce the upfront cost to the customer. 3. Business and policy innovations, to make zero-carbon technology options the cheaper, preferred solution compared to the fossil fueled alternative. 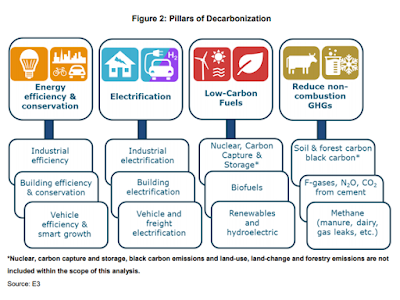 Table 1 summarizes the key strategies identified through this research that should be prioritized for scaled-up use, market transformation, and as “reach” technologies that may be crucial to meet the 2050 greenhouse gas target. The net cost of transforming the state’s energy economy to a low-carbon system is relatively small. 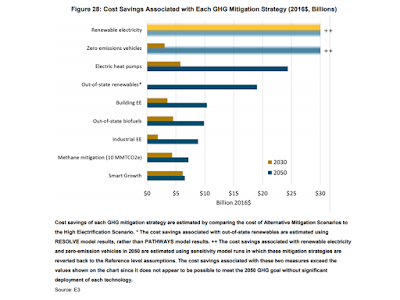 Fuel savings from reduced consumption of gasoline, diesel and natural gas help offset the higher capital costs associated with low-carbon technologies. 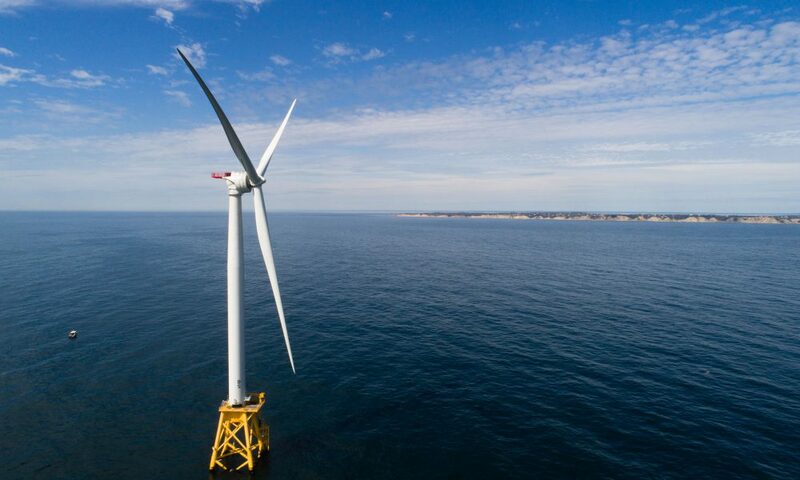 The estimated 2030 total direct cost, (excluding health and climate benefits), to meet the state’s climate goals range from a savings of $2 billion per year to net costs of $17 billion per year, with a base case result of $9 billion per year in 2030. This amount is less than the recovery costs associated with one large natural disaster, such as the recent 2017 wildfires in Northern California. 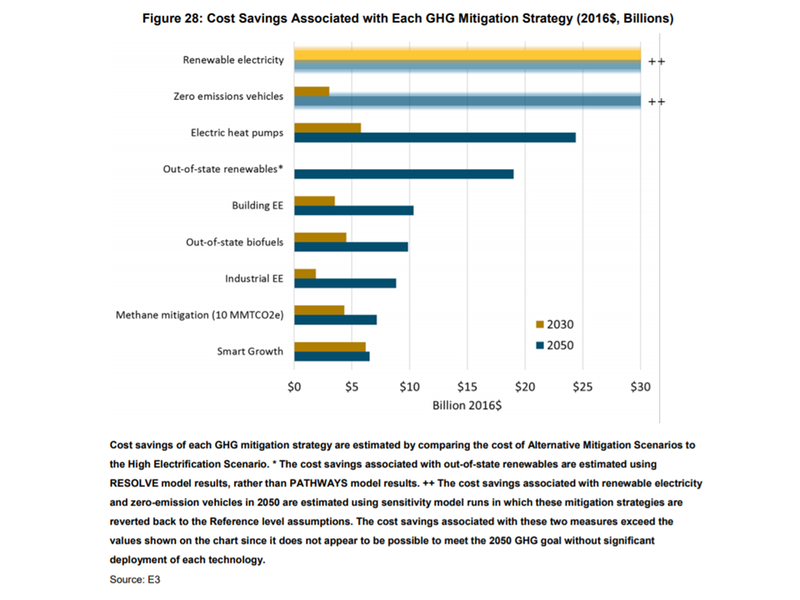 Put differently, the estimated 2030 cost of reducing statewide greenhouse gas emissions by 40 percent is likely to range from a savings of 0.1 percent to costs of 0.5 percent of California’s gross state product, and the societal benefits of the GHG reductions achieved are likely to outweigh these costs. For example, in other studies, the estimated health benefits associated with reducing GHG emissions, and thus improving air quality, have been estimated to exceed these direct costs. The upfront capital cost investment, however, is still significant, and is spread across both businesses and households – some of which have better access to low-cost capital than others. 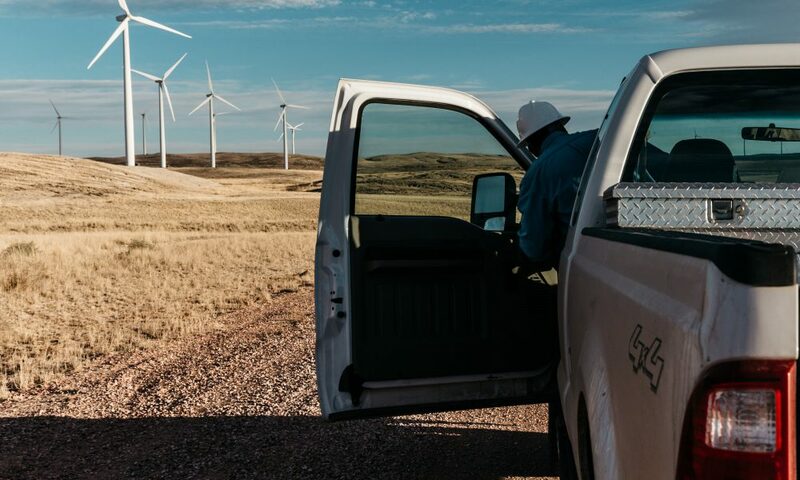 Long-term fuel savings, or even lifecycle cost savings, may not convince businesses and households to make the switch to new technologies with which they have little experience. A key challenge is convincing millions of households and businesses to adopt these technologies and become the drivers of change to a low-carbon economy. 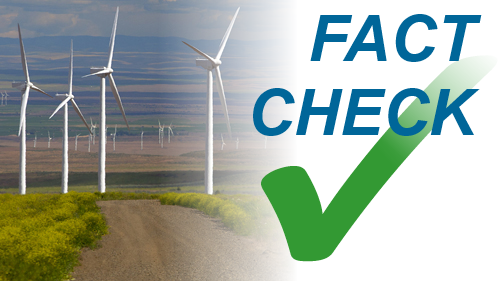 Finally, this study aggregates statewide costs and benefits, explicitly excluding the effect of state incentives and in-state transfers, such as Cap-and-Trade, the Low Carbon Fuel Standard, and utility energy efficiency programs. Costs borne by individual households will differ from the average and will depend on policy implementation. Further research could investigate the cost implications of specific state policies on individuals and businesses. While these models produce numerically precise results, the long-term greenhouse gas reduction scenarios resulting from the modeling are neither predictions nor forecasts of the future. 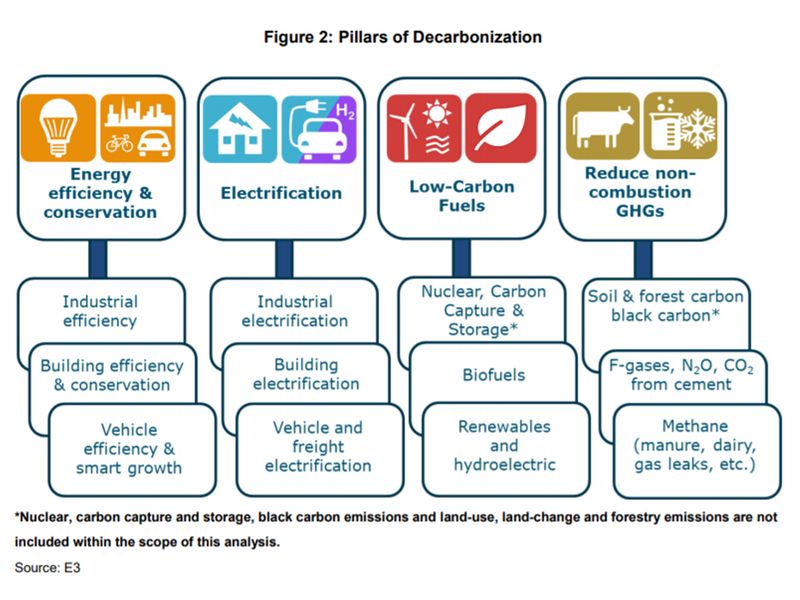 Several key assumptions, however, could change this study’s findings about the High Electrification scenario as one of the lower-cost, lower-risk decarbonization pathways. First, biofuels could be available at lower cost than modeled here, particularly if sustainability concerns with purpose-grown crops are addressed, or if other jurisdictions continue to lag California in decarbonizing their economies and so do not rely on advanced biofuels, resulting in more of the global biofuel supply being available to California. Second, high costs associated with retrofitting existing buildings for electric heating could significantly increase the cost of the High Electrification scenario. This scenario assumes that building electrification could proceed in California without requiring costly early retirement of end-use equipment, and without creating cost equity impacts for natural gas customers which must be mitigated. These assumptions deserve further research and inquiry. 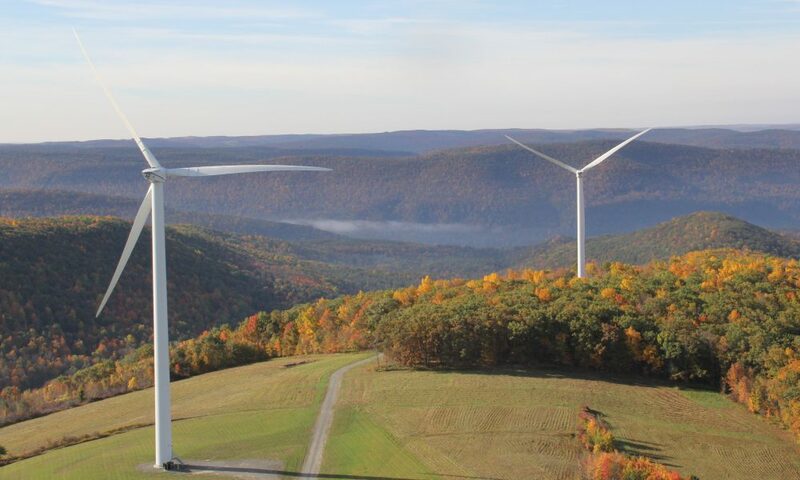 This research has evaluated options for meeting the state’s economywide climate goals, including assessing the potential effects on and implications for the electricity sector. This research provides decision-makers and researchers with information about the cost implications and emissions tradeoffs between different greenhouse gas mitigation strategies focusing on 2030 versus those focusing on 2050, and it highlights the pivotal role of the consumer to help meet the state’s climate goals. Furthermore, this research has helped fund the development of widely used energy and electricity sector planning tools, including the California PATHWAYS model and the electricity sector capacity expansion and dispatch RESOLVE model. 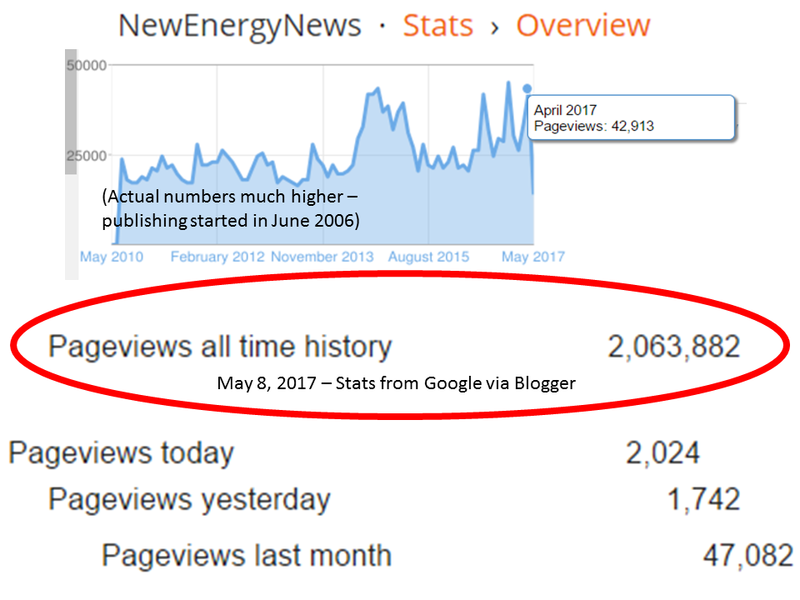 These energy and electricity planning tools have been, and continued to be, used by many California state agencies to provide unique insights into how the electricity system may evolve during the next 15 to 30 years to achieve state goals. The benefits of this project and research will continue to expand as future projects build on this work and through ongoing research and policy discussions within and outside California on how to achieve deep reductions in greenhouse gas emissions.